What were you doing before you decided to do the OSSM diploma? I was a Primary School teacher for 5 years previously. I decided I wanted to utilise my Sport and Exercise Science degree and to become my own boss. What things did you have to consider before enrolling on the course? It was a huge career change. I had to weigh up the idea of becoming my own boss and earning less money against the long hours and no life of teaching. I wrote more about my transition from school teacher to soft tissue therapist on my blog which you might find an interesting read if you are in a similar position. Besides passing! Getting to know a group of people that you perhaps wouldn’t usually get to know. I made some awesome friends that I am still regularly in touch with (weekly) asking questions and sharing ideas. During the course, I got a job in customer services (basically just to pay the bills) but after qualifying with OSSM, I got married and then moved house so I didn’t have time to really focus on the business. What are you doing now and how did the OSSM course help? 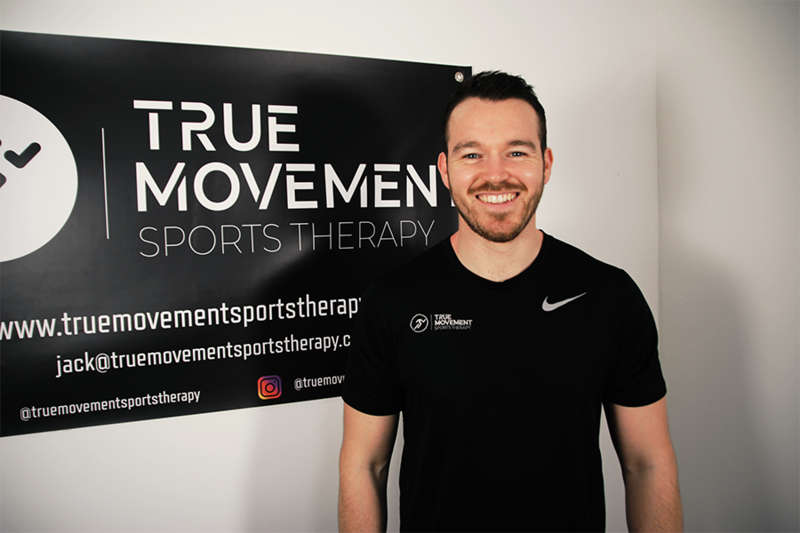 I’ve launched my own business: True Movement Sports Therapy and I’m currently mixing my part time job with my client work. I have converted my garage into a clinic, and I am open for business in the evenings which fits around my part time job. I have been having 6 to 7 clients a week. So, I have been pretty busy most evenings. Recently I have discussed with my current job to go down to 3 days a week to start to fully commit to making the business work and expanding with the aim of getting more clients to make it my full-time job. Studying is a big decision, what advice would you give others considering a career change? If you’re not happy in your current job, then do something about it! If you’re passionate enough and want it enough, you will find a way to make it work for you. What else would you say about studying with OSSM? The tutors are awesome! Special mention/shout out to Ady! He is a legend and made each weekend fun and enjoyable. So much so, that I have now been invited back as an assistant tutor to work alongside Ady and assist with other people’s training weekends, which is first of all amazing, but also very strange going back qualified and as an assistant tutor. For anyone thinking of taking the course, I would say that it isn’t easy, you need to be able to sit down and revise and study and also get the hours in. But, it’s worth it in the end! Thanks Jack for taking part! We hope you’ve enjoyed reading Jack’s story. If you are interested in finding out more about our professional training in soft tissue therapy, please visit our Introductory Massage Course page or our BTEC Level 5 Diploma in Soft Tissue Therapy page. You might also like to follow OSSM on Facebook.